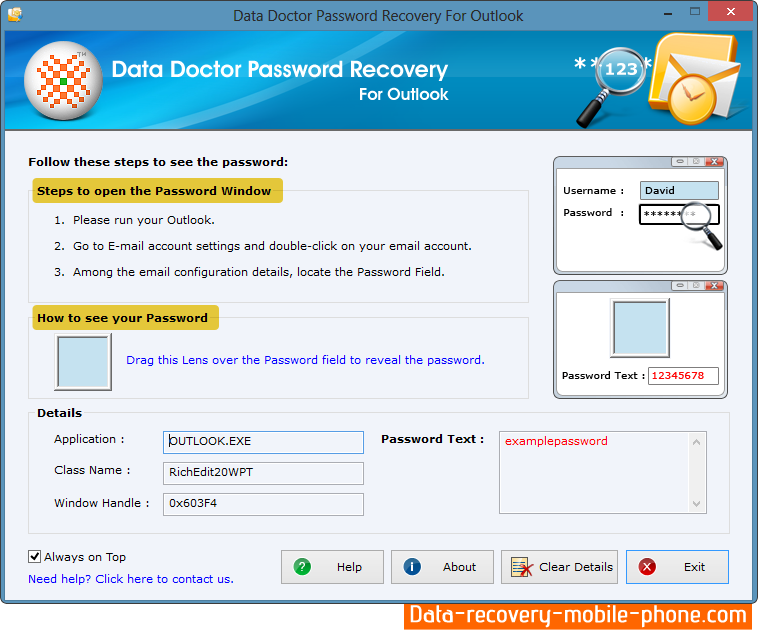 Data Doctor’s Outlook Express Password Recovery Software helps to recover lost or forgotten passwords of created e-mail account and news group account. Password restoring utility is capable to restore entire forgotten password (regardless its length and complexity) and recovers all user records including server information (such as incoming/outgoing mail Server account name and password) and server port number for the advance users. Password finder tool shows the complete detail of recovered passwords and allows saving in text file format for future reference. Recover all lost or forgotten E-mail or News group account password instantly. Restore identity passwords with multiple user account password. Software records and visualizes the settings of mail and news account. Display login password and server name, configured in POP3 and SMTP account. Revive lost passwords with support to multi user passwords (including admin and administration) and saves password list to specified area. Password finder tool finds passwords behind the asterisks. Support all major versions of office outlook and outlook express. Tool saves the recovered password in regular text file format.